Incredible feel and a power module for unlimited creativity and superior sound. 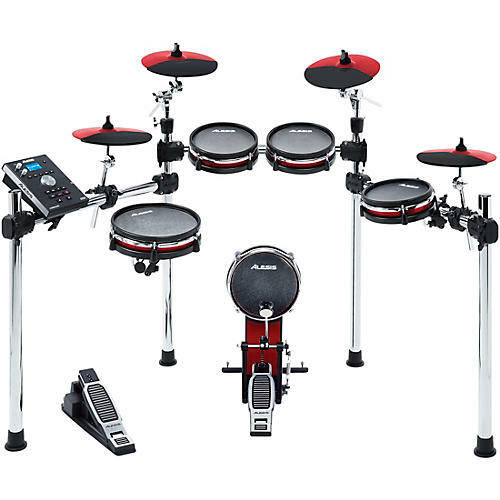 The Alesis Command X 9-Piece Mesh Head electronic drum set features exclusive Alesis mesh snare, tom, and kick pads (patented) that deliver an authentic drumming experience. Along with an 8” mesh kick and a 10” dual-zone mesh snare drum, there are also two 8” dual-zone rack toms and an 8” dual-zone floor tom. The set also features a 10” ride cymbal, a 10” hi-hat with pedal and 2 10” crash cymbals with choke. The included Advanced Drum Module features 70 drum kits (50 factory + 20 user) with over 600 sounds and 60 play-along tracks, built-in metronome to sharpen your skills and more. A premium chrome 4-post rack keeps everything solidly anchored, no matter how hard you play.